Cesar is an immigration rights activist and the first undocumented immigrant to be granted admission to the New York State Bar. 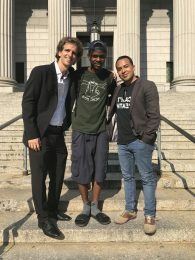 In 2014, he began volunteering with Safe Passage as an interpreter while he and his pro bono legal team were litigating his right to be an attorney. Upon receiving his law license to practice in New York, Cesar was incredibly eager to give back. One of the first cases he took as an admitted attorney was a Safe Passage pro bono case. Cesar feels that working with children is difficult in and of itself, but, working with children who have experienced trauma adds another layer of complexity. Cesar explained that when he first met his client it was hard to get him to open up as his client was very reserved and did not want to talk to anyone. Cesar decided to tell his client his own story of coming to the United States. “I saw my story in his story,” Cesar said. “Although his journey was more difficult crossing the border, our stories were the same in that it is a story of families reuniting.” Cesar felt that by describing what he himself had been through, his client was able to more readily confide in his attorney: “He began to trust me and was able to tell me not only his past, but his present, and his future aspirations.” Cesar explained that the case was very challenging, both legally and emotionally. He believes that the ongoing support of the Safe Passage staff, who reviewed documents and connected Cesar and his client with translators, social workers, psychologists, and subject matter experts, was a “critical ingredient for the success of the case.” Ultimately, Cesar helped his client obtain asylum, and Cesar is proud that his client now has a secure immigration status within the United States. Thank you Cesar for your unfailing dedication and hard work for your client and all the children you have worked with over the years at Safe Passage. We feel extremely lucky to have such a smart, empathetic, and dynamic pro bono advocate in our ranks. We look forward to continuing to partner with you on future cases for many years to come!